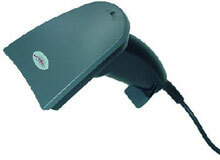 The ZB8120 is the industry leading Economy CCD barcode reader and most sought after in its class. The ZB8120 scanner offers superior scanning performance at an industry leading price. This assures the absolute best total cost of ownership (TOC) in the industry. The scanner has a depth of field of 150 mm (6 inches) and provides fast and accurate decoding. This scanner features ultra-low power consumption and has built-in multiple host interfaces, simply by changing the field replaceable cable. The ZB8120 has a high intensity narrow illumination source for easy aiming and allows the scanner to be used in any lighting environment. The product is offered in multiple interfaces including USB (HID) Keyboard wedge, RS-232C and more. The ZB8120 is unsurpassed in field reliability with a limited 5 yr. warranty included. That is why the ZB8120 is the scanner of choice for cost conscious applications.